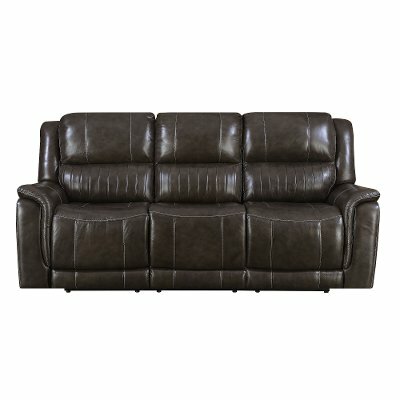 This gunmetal gray leather-match power reclining living room set from RC Willey allow you to find your perfect position and keep it. With the simple touch of a button, you have access to an infinite number of reclining positions as well as head and neck positioning. Find your perfect TV watching or reading spot and save it for next time. Let RC Willey help you make your home. Your way. Find your perfect position and keep it with this gunmetal gray leather-match power reclining loveseat from RC Willey. With the simple touch of a button, you have access to an infinite number of reclining positions as well as head and neck positioning. Find your perfect TV watching or reading spot and save it for next time. Let RC Willey help you make your home. Your way. 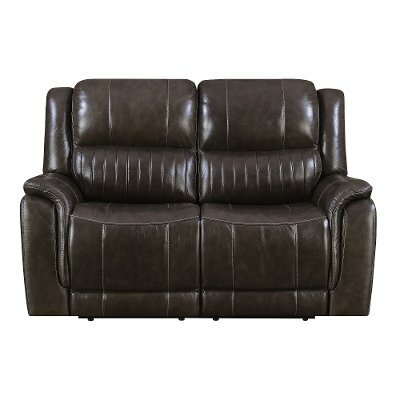 Gray Leather-Match Power Reclining Living Room Set - Hearst is rated 5.0 out of 5 by 3. Rated 5 out of 5 by CabinRetreat Complete comfort The Sofa and loveseat recliners are lovely to look at and super comfortable to sit in. Even our young grandson insists on sleeping in it over a bed. Rated 5 out of 5 by Bobski99 This Product is very comfortable and well Built We love our Sofa and Love seat. The power recliners are great and the added usb charging makes my wife happy. Both units appear very well made and sturdy. We would definitely recommend this product.